The impacts of climate change are vividly expressed in ecosystems, and such climate-induced alterations can be monitored in vegetation. Lately, mountain ecosystems have undergone accelerated changes due to rising temperatures. Temperature is a primary influencing factor promoting the snowmelt and length of the growing season, which crucially determines the nature of plant communities in alpine timberline ecotones, by affecting the productivity, composition, and diversity of an ecosystem. In general, species are expected to shift their distributions pole-ward in latitude and upward in elevation with respect to climate change, and ecological monitoring can detect them in a shorter time. Several factors collectively control the upper extent of timberlines. Being highly sensitive, the vulnerability of the Himalayas to climate change is well acknowledged by scientists; however, the Himalayan timberlines are less explored for climate change-driven vegetation changes than those of European timberlines. The eastern Himalaya, on the other hand, which generally maintains greater moisture having with rich biological and cultural diversity than the other Himalayan parts, is less explored, comparatively. At the global scale, studies have witnessed an elevational expansion of the forest line in many mountain ranges, such as the Polar Urals (Russia), the central Swiss Alps, western Himalaya (India), the Rocky Mountains (Southern Alberta), and central Himalaya (Nepal). This upward forest expansion is expected to shrink the extent of the alpine ecosystems and possibly results in species loss and ecosystem degradation. However, primary evidence on the recent plant diversity trends in mountain systems is still scarce and mostly based on resurveys of earlier-studied sites. Worldwide, the alpine timberline in high mountains, which characteristically distinguishes the upper limit of closed canopy forests and represents a major zone between the forested and non-forested vegetation, is one of the most sensitive ecotones and an indicator of a warming climate. To understand the nature of timberline ecotone and to collect primary data on timberline vegetation structure, species composition, regeneration rate, along with the upslope movement of dominant timberline tree species, the ecological exploration was aimed in the Indian part of the eastern Himalaya. 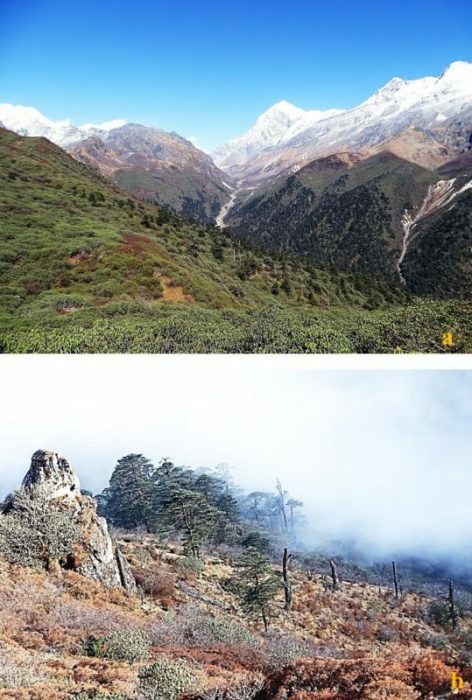 The study was conducted in Khangchendzonga National Park (KNP) in the Sikkim state, the first mixed category (of nature and culture) UNESCO World Heritage Site in India, inscribed in 2016. 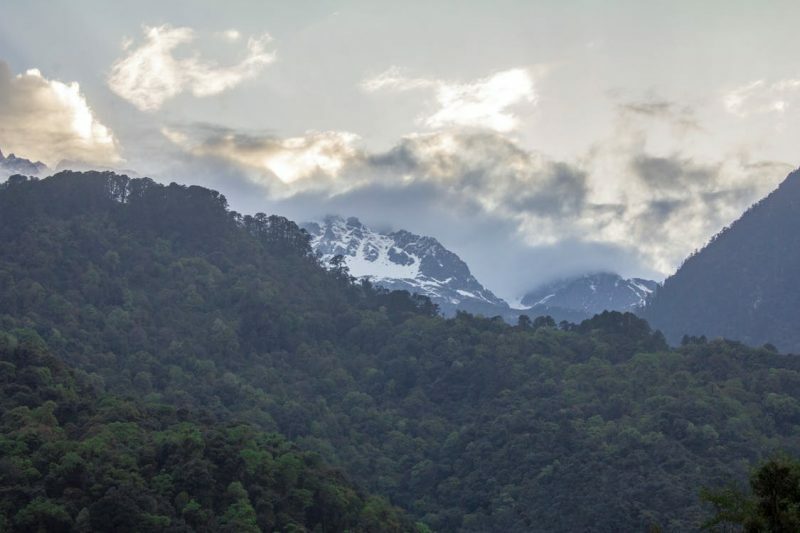 The KNP is the core zone of the Khangchendzonga Biosphere Reserve, which recently included in the World Network of Biosphere Reserve by UNESCO in July 2018, as a result of strong conservation policies of the Sikkim Government under the long-run leadership of Chief Minister Pawan Chamling. Horizontally, a timberline stretch along 20 Km of the Dzongri landscape of KNP was surveyed for woody taxa assessment. The extent of upward movement of dominant timberline tree species was recorded by observing their regeneration status above the timberline. Two well-studied non-parametric estimators (Chao 2 and Jack 1) were used to check sampling efforts, and estimated values were found in close connection with the tested estimators and authenticated our sampling efforts. The distribution patterns of species within sites was analyzed using abundance-to-frequency ratio (A/F). Pearson’s correlation was used to assess the relationship between ecological and environmental variables. To find microclimatic similarities among studied sites, researchers opted for an unweighted pair group method with arithmetic mean (UPGMA) agglomerative-based hierarchical clustering. The canonical correspondence analysis (CCA) was used to study interactions between environmental variables and the vegetation composition of the timberline. Family Ericaceae emerged as the most prominent family, with the reorientation of 13 species in timberline forest of KNP. The timberline vegetation was classified into five forest types/communities and mainly dominated by Abies densa, followed by Sorbus microphylla, Rhododendron lanatum, and Rhododendron wightii in the tree layer; however, Rosa sericea, followed by Ribes glaciale and Juniperus recurva, have shown dominance in the shrub layer. The entire study area represented by an average tree density of 374 individual ha-1. 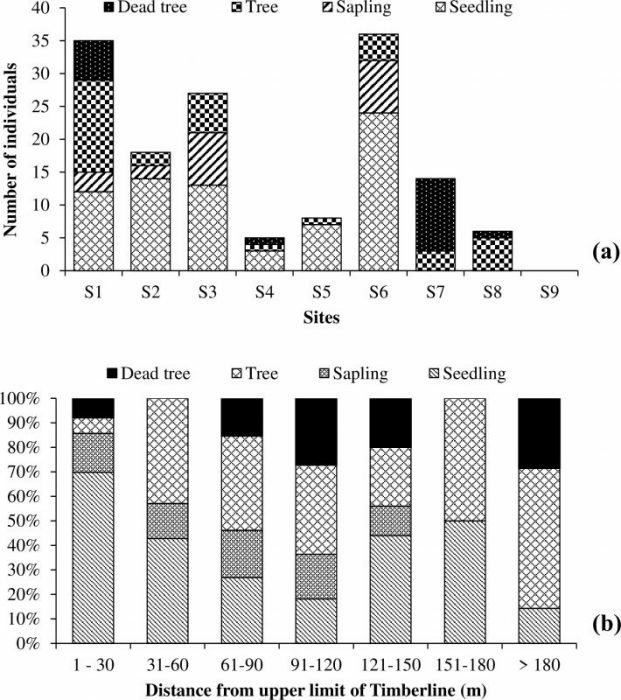 Individually, the significantly highest average tree density was recorded for Sorbus microphylla, followed by Rhododendron lanatum and Abies densa. The total average shrub density was recorded 162 individual ha-1 with the significantly highest density for Rosa sericea. The overall distribution frequency of woody taxa was observed to be slightly heterogeneous across the timberline, which varied from 3787 m to 3989 m above sea level. Among the tree species, overall, Abies densa dominated the timberline vegetation, and Sorbus microphylla and Rhododendron lanatum were the most frequent tree species. 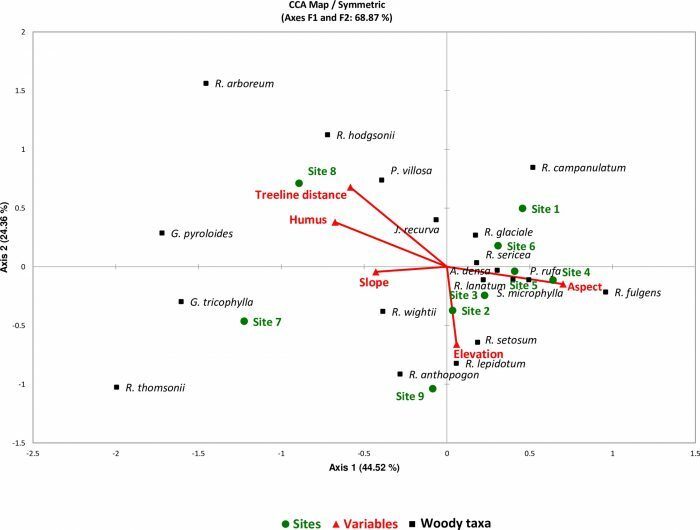 Canonical correspondence analysis (CCA-tri-plot) indicated that all the environmental factors substantially influenced the timberline vegetation and the most determining factor was elevation along with the slope and humus. The vegetation cluster of high elevation study sites consists of all Ericaceae members such as R. wightii, R. thomsonii, R. anthopogon, and Gaultheria tricophylla. The treeline occurred up to 4011 m asl, which is higher than the treeline elevation of the western Himalayas (<3500 m asl). Across the transect, the distance of the treeline from timberline has shown an irregular trend. The maximum distance (187.7 m) between the timberline and treeline was observed as having fair regeneration, though the number of seedlings declined with the increasing distance from the timberline towards treeline. Further, the conversion rate of seedlings to saplings was poor along the ecotone. However, the presence of dead standing trees of Abies densa at a higher distance (>180m) from the current timberline indicates elevation decline of current timberline in certain sites. It also indicates that in the past, the timberline was higher, and this might be a remnant treeline which could be related to the pre-historic anthropogenic disturbance, as the Yak herders were using this area before a governmental ban on grazing. The present study trends conclude that the upslope advancement of the timberline is unlikely to occur in the near future, whereas the area between the treeline and the timberline (timberline ecotone) can become densified in the near future in KNP in the eastern Himalayas. 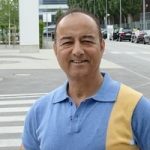 The study demonstrates a methodology for monitoring the status of timberlines and that can act as a blueprint for further assessment of timberlines across the Himalaya and elsewhere in high mountains, for getting a holistic picture of timberlines, as one of the most sensitive ecotones, which may offer vital clues on the impacts of warming climate. These findings are described in the research article, Timberline structure and woody taxa regeneration towards treeline along latitudinal gradients in Khangchendzonga National Park, Eastern Himalaya, recently published in the journal PLOS ONE. This work was conducted by Aseesh Pandey, Hemant K. Badola, and Sandhya Rai from the GB Pant National Institute of Himalayan Environment & Sustainable Development, and Surendra P. Singh from the Central Himalayan Environment Association (corresponding author: hkbadola@gmail.com). Aseesh is a research scientist at the G.B. Pant National Institute of Himalayan Environment and Sustainable Development, Sikkim Regional.